Beauty in the Basement: A Vintage Singer Unearthed! 96 years old, and she still has perfect tension! My parents’ basement flooded recently and in the process of mucking it out, my mother came across a beautiful Vintage Singer. She didn’t remember its source at first, and my Bobie (grandmother) didn’t think it was hers either. But after some thought and digging around in her own basement, Bobie realized that it was indeed her first sewing machine, the one she learned to sew on in the 1950s–she even found the thread, bobbins and projects she had for it, and the table she had it installed in. She apologized for not recognizing it instantly–but I told her that when you’re 87, you’re allowed to forget things occasionally! Eventually they moved to a bigger house and she decided to learn to sew dresses for her two daughters–who had particular ideas about what they wanted to wear, unlike my dad!–and clothes for herself. She thinks she got the machine from her family, and that they had had it for quite a few years before that. When she upgraded to a newer machine many years later, she gave the old Singer to my parents, and into the basement it went. 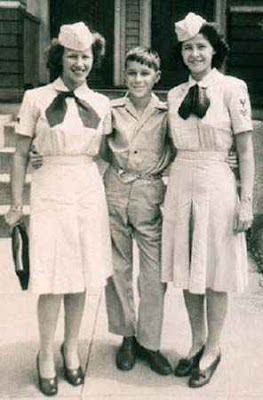 Here’s a photo of Sylvia (that’s her name, by the way–Sylvia Katler, born Sylvia Fishman) in the 1940s looking sharp in her Coast Guard uniform–she’s on the right, and that’s her sister Sarah and brother Milton. Most of her nine brothers and sisters were also in the service during WWII (Milton was too young, but served in the Korean War). 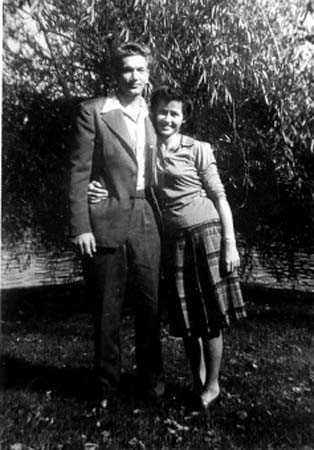 Here are some photos of her with my grandfather Leon Katler, also from the 1940s–don’t they look glamorous? 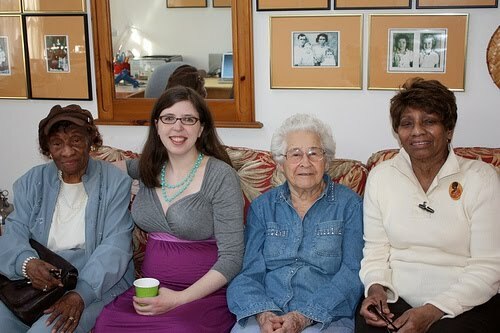 Here’s a recent photo of me and Sylvia at my baby shower, with my grandmothers-in-law Theresa and Wilhelmina! 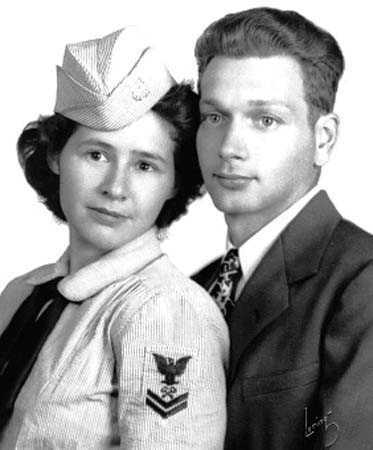 And should you be interested, in college I put together a short collection of some family stories she told me about her life growing up in old Jewish Boston, her time in the Coast Guard during World War II, and beyond. I at first assumed it was a 1930s or 1940s model, but my blog readers tipped me off to the serial-number lookup on Singer’s website–they even had a PDF of the instruction manual. It’s a Model 66 (G-Series), manufactured at the Elizabethport Factory in Elizabeth, New Jersey in 1914, along with 25,000 others of the same model. My mother Beryl took it for a test drive (see her photo gallery here) and reports it has perfect tension. Sadly she lives 5 hours away, and I’m too close to delivery to want to travel anymore… so I probably won’t lay my hands on this beauty until well after Cartoonist Baby arrives! Luckily this reminded me that my good friend Mary has a similar machine right here in Brooklyn, so maybe I can play with hers. No offense to my computerized Viking and her 60+ stitches, but I doubt she’ll still be in service in the year 2101… and she was never this pretty! i have an old singer at my parents. one of the first electric models. weighs a TON. That's the thing I like about vintage (machinery especially) built to LAST. i could probably throw it out the window and it would still work perfectly! I also have my cousins sewing machine that used to belong to my great aunt, the daughter of a Jewish tailor. It is nice to have a sewing machine with a personal story I think. Such a lovely find. What a gorgeous machine, and such history too! I used to sew on an olive-green Bernina from the 50's, not quite as old, but I agree that the older machines are built to last! (And weigh a ton…) You'll enjoy this machine forever. Oh, wow!! Such an amazing machine with an equally amazing story. Thanks very much for sharing. I love to hear the history behind things. Right now I'm borrowing my granny's 1951 Singer Featherweight (it's my mum's now). Sews like a dream. Thank you SO MUCH for sharing your stories and pictures! It brought tears to my eyes! I just love hearing stories like this… and the machine is a beauty. Don't ever get rid of it! I thank you too. I loved hearing about this and all the photos too. a friend of mine just gave me the same exact machine!! congratulations on your recent acquisition too — Isn't the decorative detail on it lovely? A real Treasure-the machine and your sweet grandma. 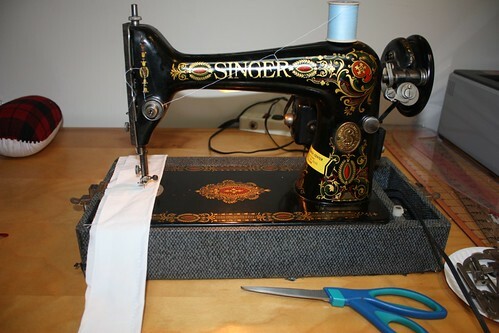 That is the most beautiful sewing machine I have ever seen. 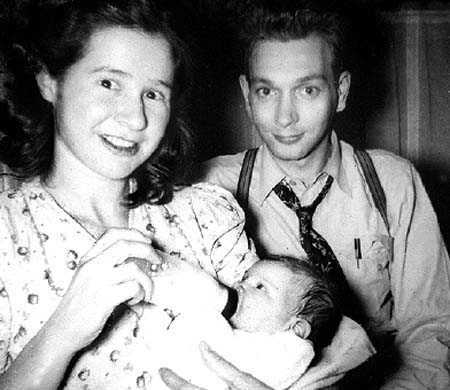 How lucky you are to have it, and to have your grandmother, she looks like a neat lady. What a great story. And those fabulous pictures from the 40's! Didn't everyone look great in pictures back then? 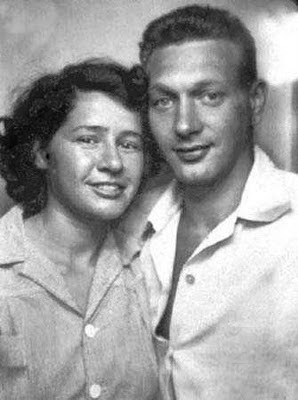 Times were really tough, but they always tried to look their best. Well, they are the greatest generation.